Attract more customers with big announcements. Need a low cost, effective solution to marketing your new store, real estate business or big event? Hand out flyers in areas near your store or distribute them within your target market’s vicinity. 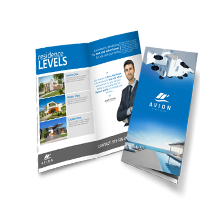 Flyer printing produces designs customized to your message and tailored to your brand. PrintPlace offers a wide variety of durable paper and cardstock materials for your custom flyers. 70 lb. paper is our lightest, most flexible option. 80 lb. paper is as thick as magazine paper. 100 lb. paper has the same thickness as art or coffee table book paper. 10 pt. cardstock is a lightweight, durable choice. 14 pt. cardstock is foldable, but slightly thicker. 16 pt. cardstock is the thickest, most durable option available. High gloss UV for that extra, high-reflective shine. Gloss to make every color extra bright and shiny. Matte for an elegant, sophisticated look to your design. Sizes range from the standard, compact 4” x 6” for easy, mass distribution to the letter-size 8.5” x 11” perfect for real estate flyers. Need a business flyer that customers will want to keep and post as a reminder? Create metallic flyers that show off your announcement in gold, silver, copper, black, blue or red accents. 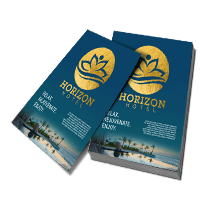 Spot UV can be applied to highlight important details such as the venue, date or time.That extra shine is the perfect complement for the design on an event flyer. All product pages have flyer templates you can download to get started on your flyer printing. Have any questions about our products? Our print experts will gladly answer them and provide additional clarifications.